Sciblogs | GMOs and the plants we eat: neither are "natural"
GMOs and the plants we eat: neither are "natural"
Some say that genetically modified plants are a concern because they’re genetically modified organisms (GMOs), that “natural” plants are safer. Yet what most people call “natural” foods are rare mutants that have been selected or have been artificially bred (or often both). They have much more dramatic genetic changes than GMOs. Changes that scientists are still learning about. Foods we eat today bear little resemblance to the wild species they were originally derived from. Even plants that we might not at first consider to be cultivated have been selected for many hundreds or, more usually, thousands of years. This line of thinking always reminds me of Christian evangelist Ray Comfort’s “designed” banana: natural wild bananas are nothing like the edible fruit. Wild bananas produce small fruits with large hard seeds and are essentially inedible (or at least unpalatable!). Ray’s “made for man” banana is man-selected cross of red and green bananas that has been bred over thousands of years resulting in a pollen-less, seedless fruit. Our food banana is a genetic mutant on a giant scale, triplicating it’s entire genome. 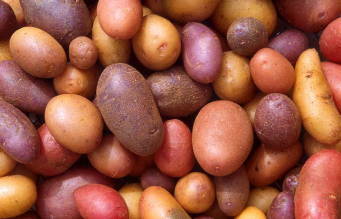 In a similar way, the wild counterparts of the tubers we eat today are tough bitter roots compared to the large fleshy crops we now take as “natural”. It’s understandable, though. Most of us haven’t seen anything else and we don’t think much about where they came from. You’ll tell me that our food is the result of cultivation, one of those things that made man such a dominant species and you’d be right. Picking out rare mutant plants that are better to eat and selectively growing them will eventually lead to a crop that’d never exist in the wild as a whole crop. Over time we’ve made rare (and generally, weak) plants common through selectively cultivating and nurturing them. We’ve gradually changed them to be increasingly different to their wild cousins. Essentially, we’ve evolved crops to suit ourselves. A smarter way is to bred plants for particular traits by exploiting the rules of genetics, “crossing” plants to try bring certain traits or mixtures of traits out. It’s slow and laborious. You get to grow large numbers of plants over several generations to try bring out a trait. One way of speeding up the breeding process is to generate more individual plants with different genetics and hence different traits to select from. Natural mutant plants are mostly a result of radiation from the sun. The genetic changes that occur are rare, random and happen anywhere in the genes of the plant. Chemical mutagens applied to plant embyros or seeds can be a way of getting more of the same, quicker. 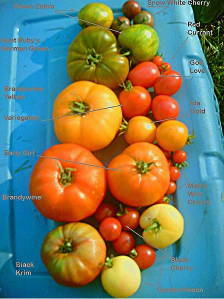 Useful traits, say, a larger tomato or resistance to soil salinity, can be selected and breed. 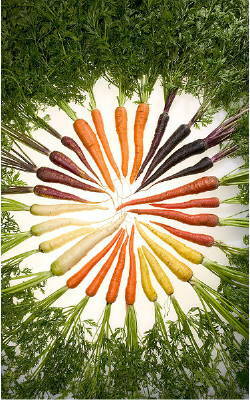 You won’t know what genes have been altered, nor how many, but that’s also true of the naturally-occuring mutants too. There are other ways of generating new varieties, of course. A botanist or plant breeder would give me a very long list of them! They’d include hybrid techniques and growth from calluses, for example. All of these exploit altered genetics in different ways. Most of those “natural” healthy and tasty plants down at the supermarket are the result of these approaches in one way or other. All can produce damn fine food crops and they’re OK, provided they’re tested. People have learnt from mistakes, of course. If you make a new strain, better make sure you test it properly. It’s not how you make the new plant, it’s how you test it. Selecting and breeding plants has a flaw: you might select for one trait, but the genetic changes for other traits can–and will–come “for the ride”. These hidden changes are much more complex and less well understood than those from GE. When nature tinkers, “she” can make far more radical changes than scientists do and scientists have to figure them out after the fact. GE is much better at ensuring breeders don’t get unknown, untested genetic variants. A GE approach makes very specific changes that the breeder determines and only affects a small, specific, parts of the plant’s genes. Using GE, breeders make specific changes without having to select from random variations in rare individuals or finding ways to generate more variant individual plants to select from. Breeders can create plants that would be impractical to generate using conventional breeding, but are useful. GE isn’t cheap or easy, but the initial breeding stages only have to be done once. I imagine if you philosophically object to “blind tinkering”, I’d hear you tell me we have to use GE methods. Either way, what makes the plant safe to eat is food safety testing, not how the plant was made. Foods are tested to be safe for the vast majority of people. They’re tested better than they ever have been. Our pre-historic foraging ancestors probably tested unfamiliar plants by sampling a tiny piece and waiting for a few days too! If you’re still concerned about food safety, just eat a small amount the first time. Then stop worrying, life’s not worth that, eh? At last, a modicum of reason in the GE debate that says everything that needs to be said. I personally welcome eating GE food – it’ll taste better than the organic crap. I’ve kind of wondered if people realise that everytime organisms breed (sexually) we get new genetic variants. Both recombination and mutation throw up a countless stream of new genetic variants all the time. Afterall, killer bees are to all intents and purposes at an evolutionary level, still honey bees. This sheer scale and volume of these new genetic experiments by “Nature” are immense. Novel diseases and pests are liable to be thrown up at any point in time. Our own efforts with GE seem vanishingly insignificant and imperceptible compared to what Nature experiments with. Aimee: Me too. I was just reminded of it with the recent fuss in one of Peter’s posts. I wish I could say that it’s a point that people are “over” and this article is just closing the door after you’ve walked through it, but I get the impression that some people are still stuck on the idea that GMOs are inherently dangerous. Brendon: Good point. I did briefly consider pointing out the truly natural breeding also throws up genetic variation, but thought I didn’t want to confuse readers seeing that my point was about foods. Can you compare timescales: the rate at which surprises arise in natural, bred and GM populations? The frequency by which dangerous events occur is critical in risk assessment. In the context of ecological surprises, I also wonder how human-trafficked invasives compare with each of these, though I’m pretty sure invasives win this competition. Sorry I’m slow to reply. I’m not entirely sure I’ve got what you’re after right, so let me know if I’m not getting your intended meaning. There’s practical element (horticulture) and an academic element (genetics) to your first question. The academic side. If by “surprises” in your first sentence you mean the rate that “natural” mutations occurâ€”e.g. from solar radiationâ€”it’d be the essentially same for all three, provided all other things are equal, e.g. same exposure to the sun, comparable species, etc. The difference is the environment they’re in, etc., not if they’re natural, bred or GM organisms. Different varietiesâ€”however they are derivedâ€”can be more susceptible to (say) sunlight than others, but that’s not about the method used to derive them itself, which is what you’re after, but the basic stock (“parent” plants) they’re derived from. As for “ecological surprises”, you’re moving to another topic and one I did consider writing about separately. Maybe I’ll get around to it at some point, as I think much of the fuss there is misdirected too, although in a slightly more subtle way. Yes, I’m moving a little beyond the genetics here. By “surprise” I mean a euphemism for a dangerous new gene combination – dangerous to other organisms (either as food, predator, or competition). These can arise naturally (e.g., killer bees), through assisted breeding, or through GM. Each change the genetic material, but do so in different ways and at different rates. By rate I mean the timescale of a new genetic difference popping up. The rate is important. A slower rate of natural evolution may allow other organisms to keep up, and not get swamped by the new threats. A faster rate of assisted genetic modification may out pace other organisms’ natural evolution. Invasive species, for example, while not presenting novel genetic material globally, do present novel genetic material locally. Their rapid arrival, with usually a suite of strategic and tactical traits, can leave natives in the dust. So to address the risk of any of these means of introducing novel genetic information (natural, breeding, GE, invasion), the rate of exposure of hazardous innovations needs to be considered. I have no idea how the rates compare, except that I know invasives and introduced crops probably take the cake ecologically. I wrote a long reply, but somehow my browser has thrown it away. I haven’t time now try do it again. In a nutshell what you’re arguing doesn’t make sense (sorry for being blunt, but I’m out of time for flowery additions). Basically, “rates” have nothing to do with it. It’s wrong on too many levels for me put them all right, but consider this as one case for you to think through: introducing a new crop (of any sort) to an area it hasn’t been in before. It doesn’t matter how it was derived, it’s just new. I think you’re forgetting all crops were/are introduced like this at some point. GE crops aren’t different in this. In practice, GE plants are tiny variants on existing crops and would be less likely to throw up unexpected effects than conventional breeding. Very important: testing levels this out. Your argument leaves this out. “Invasives” have different issues. There is a place for comparing them, but not in the way that you’re doing: mutation rates haven’t anything to do with it. Bear in mind that crop plants generally are gutless competitors (they barely survive without a lot of man-supplied nurture), they aren’t competing with anything, they’re grown from seed (as I pointed out before), and so on. These are crops, not wild plants. Well, you answered my question (novelty rates in GE are lower than breeding), as well as putting words in my mouth. Rate of mutation or novelty is very important in ecology, but by your last statement I am now assuming you have an anti-anti-GM drum to beat rather than a pro-science one. In the case of creating the initial changes, there isn’t really a comparison. The latter is a rate in the usual sense; in GE, the changes are created so they’re single events. In the sense of much “new stuff” is typically the outcome of one round of mutation, it’s neither nor. In GE only one gene (or so) is altered, but on the other hand you only release things that have made a difference. In “natural” mutations, as I wrote, many will be neutral or negative, but where they are positive, you can have more changes that in GE. You can only talk in generalities in the end. It complicated by choosing either to look at what you consider a mutant to be, an observable change (e.g. an observed phenotypical difference) or a genetic change (i.e. 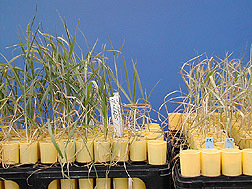 genotypical difference), in which case their may be no observable change (or the plant may simply be too weak or infertile so no offspring are observed). In the sense of mutation rates, as it’s usually applied to plants once it’s existing as a crop at a genetic (genotype, not phenotype) level, they’re essentially the same for both as I wrote in my first reply to you. Yes, in natural ecology in an on-going setting where a rate would apply. But that’s not the situation in the case of introducing a new crop. In that case it’s an event, not a rate. What’s relevant in there is the event itself, the introduction of the new crop, species, etc. but by your last statement I am now assuming you have an anti-anti-GM drum to beat rather than a pro-science one. And when we are clear on the timescales of interest (event vs duration), I am now pretty sure we’re on the same page. When I think of risk – which is what some opponents of GE essentially think about, and what I think about when any new genetic material gets into an ecosystem – I see it as Risk = Hazard * Exposure. Integrating over many introductions or modifications, rate becomes a key element of exposure. In terms of crops, we can also think of rate in the sense that there is a rate at which new GE crops are developed. This, I concede, must be separate from the method of modification, but still relevant I think in terms of policy. How does a “man-selected cross of red and green bananas that has been bred over thousands of years resulting in a pollen-less, seedless fruit” undermine the ‘design’ argument? I can’t see ‘design’ advocates running for cover in the face of this attack on a “designed banana”. The more arduous and unlikely the process, the more evidence that trial and deliberation is needed to achieve a satisfactory end result. Why would those concerned about horticultural GMOs be reassured? Once teleology is admitted, then the process of realisation is less relevant than your rebuttal requires. The debate simply shifts to the validity (or for some, the utility) of the concept of an “idealist banana”, which all physical bananas are progressively realising (Comfort), or not (philosophically-oriented GMO opponents). For instance: How is the realisation process relevant to a ‘design’ thesis that asserts it is the cumulative existence of “made for man” bananas, planetary conditions, gravitational constants, etc. …, that implies a teleologically- and anthropically-oriented world? The anthropic rejoinder to your implied assertion of imperfection from ongoing process is: ‘Yes – but from whence the >possibility< of a "made-for-man" banana?'. Why is it that a "made-for-man" banana exists, at all?'. Likewise: How does lumping GM and breeding together as "tinkering" with nature address the concern about GM crops derived from a teleological view that humans exist by and for Nature, not Nature merely for humans? I suggest that the reference to Comfort is simply an attempt to surreptiously disparage those more concerned by GMO food plants, or those who give greater recognition to social, ethical or aestheic values (i.e., "naturalness"), by association with a "Christian evangelist" ( … *Shock* *Gasp* *Disrespect*). How exactly is the technological/rationalist argument for deploying GM crops promoted by such criss-crossing, implicitly ad-hominem, and simplistic argument? My article isn’t even attempting to address “the â€˜designâ€™ argument”, let alone “undermine” it 😉 I think that’s pretty clear to most readers. The first is that (most) of the modern food plants we eat aren’t “natural”, a point people of all walks of life have understandably missed given it’s something not many people think about. The other is that it’s not how the plant is bred/created/what-have-you that’s important for food safety, it’s the testing. The subject matter is not particularly connected to religion, nor was I writing with that in mind. The reference to Comfort’s banana argument is just for a little levity and a well-known reference to the comparison of foods and their wild counterparts, as I elaborated in the article. You might want to know that Ray Comfort has been taking back his “banana argument” for a good number of years from I’ve read elsewhere; if that’s right he doesn’t stand by it anymore either! It’s a fair point that there are some Christians who have an ideology that considers a number of “man-made” things to be “unnatural” and hence to be avoided. They’re not the intended audience of my article, and I didn’t have them in mind when I wrote it; perhaps the notion that their “natural” (or “God-made”) foods aren’t might be awkward for some of them. You’d have to ask them, I can’t really speak for their beliefs. That said, I’d like to think that most people involved in horticulture, religious or not, accept that breeding, etc., has man’s hand involved as it were. Getting way off-topic, Lovelock’s Gaia hypothesis is widely misrepresented. As the term “hypothesis” conveys, it’s an idea, and one that pushes boundaries, but it’s not one based on teleology and he’s said as much himself (e.g. “Nowhere in our writings do we express the idea that planetary self-regulation is purposeful, or involves foresight or planning by the biota.”). I’m not sure the arguments that most “anti-GMO” people express are teleological, at least that I’ve seen. They might be ideologically-founded or based on reasoning others disagree with but, if anything, they seem based on effects they are concerned about, not “purposes”. There’s a difference between saying something is “the natural order” and saying something “has a (higher) purpose”.